Birgit Ulher, trumpet; Lou Mallozzi, turntables, CDs, microphones, organ pipes, amplified voice; Michael Zerang, friction drum, wind whistle, xylophone bars, snare drum, bird calls, metal. 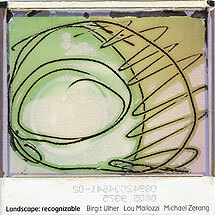 Recorded on 5 June 2004 at Experimental Sound Studio, Chicago. Polaroid (front cover reproduced above) by Birgit Uhler; design by Carlos Santos.